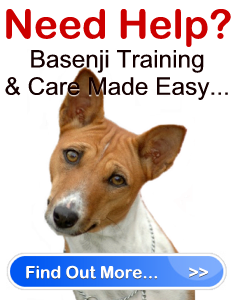 Basenji Dogs Made Easy " "
Basenji dogs are great hunting dogs that hail from Africa. They are revered for their expertise in hunting in their native land. These dogs were usually used for tracking, recovering and other game-related functions. These dogs were also used to be presented to pharaohs in Egypt as gifts. This hunting prowess has also earned much praise outside of their native land and Basenji dogs were introduced in England during the late 1930s; later on, they were introduced to the United States in the 1940s. Basenji dogs are typically moderate in height, with a coat that is not prone to excessive grooming due to it being short. Their coats differ in colors of chestnut, black and sometimes tricolors that sometimes show in brindles; their feet are usually white in color, but the white color never dominates the overall color of the dog. They are muscular in build and most dogs seem to be very lean and ready for bursts of energy, which they normally are; their posture usually resemble that of a racehorse that is about to trot. They have wrinkled heads that are proudly presented by a strong neck that is as elegant as the rest of the dogs body. They have short to moderate muzzles, forward-facing eyes, tall and slightly hooded ears, and teeth that form a uniform scissor bite. What is interesting about Basenji dogs is that they do not bark they usually emit a sound that is similar to that of a yodel; they do, however, growl, whimper and whine like most dogs. Since these dogs were bred for the hunt, these dogs have boundless energy, and often need ample space to exert and play around. That being said, these dogs tend to be destructive around the house if left unattended. Often these dogs are aloof and would often introduce themselves to strangers when they see fit this comes from their independent and sometimes mischievous nature. It is quite a task to train them, but these dogs can get by with positive reinforcement. Socialization is also paramount for these dogs in order to foster a more tolerant and desired attitude from them, especially if there are other pets or children in ones household. These dogs are not the usual run-off-the-mill dogs; they are cat-like dogs that can prove to be a challenge to raise. But for those who are up to it might find that these dogs irresistible!